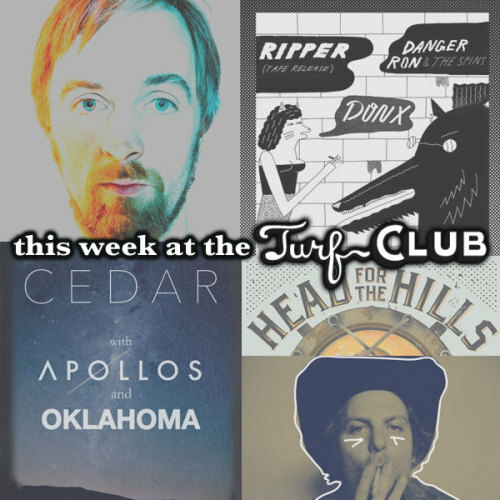 The ever-changing and highly-exciting House of DOSH residency continues this Tuesday at the Turf Club. His last two residency nights have been greeted with near sell-out crowds being treated to some awesome experimental and new jams from the multi-instrumentalist savant, and Minneapolis native Martin Dosh. This Tuesday he promises a hip-hop night, inviting some still-unannounced friends to be joining him. He is no stranger to the Turf Club, and one may say it is his potential favorite. His work with The Cloak Ox, Andrew Bird, and Ghostband has made huge waves here in the Twin Cities for years now, and is treating his many fans with this great concert series on Tuesdays of this month. Local "Surf punk blast" rockers Ripper will be releasing their debut EP this Wednesday night at the Turf Club, joined by Danger Ron & The Spins and Donx. The grunge/garage rockers will be performing and selling tapes of their self-titled three-track EP at the show. The group features old school "first take" production, with Danny Holden on lead guitar and vocals, Jeff Brown on drums, Noah Paster on bass, and Mark Schumacher on second guitar. Their high energy punk rock is powerful and fast, and makes for some serious head banging, as most of the tracks clock in at under 2:30. Don't miss this promising power band in the Entry before they blow up soon enough, and check out their awesome performance from this past summer in the video to the right. Formerly Cedar Avenue, this group has recently changed the direction of their sound into an exciting new genre. They've since ditched their previous pop-sounding ambiance for a new primal and minimalistic tone, effortlessly layering guitars, synths, and beautiful melodies into their newest Siren EP, which has garnered serious airplay on indie airwaves nationwide. Post-rockers Apollos will be joining, also from the Minneapolis area. In addition to this already awesome lineup, husband/wife duo Oklahoma will be bringing their talents to the Turf stage for their debut in St. Paul. In lead-up to the famous St. Paul Red Bull Crashed Ice Event, the Turf will be hosting a FREE event this Friday, featuring some serious Twin Cities talent. Minneapolis' own Lizzo will be rapping and singing, becoming a favorite here in the area and was just recently announced to be the Sleater-Kinney opening act for their upcoming tour. Infamous DJ Shannon Blowtorch will be also joining the crew, known for her work with All the Pretty Horses and for being a highly-talented sound engineer. She is currently working with Le Tigre's current project, MEN and for throwing some of the best dance parties in the area. Jonathan Ackerman will also be on the bill, known for his work as the Northern Grade music manager. Catch them all this Friday before the big event! Unpredictable group Head for the Hills will be showcased this Saturday night at the Turf. Their neo-bluegrass, alt-string music has been genre-defying, and extremely fun-- and perfect for the Turf club audience. They've been named the best bluegrass out of Colorado, and have won numerous accolades for their work. Their influences and tastes are far-reaching, each finding the genre late in life, which has worked as a heavy advantage for the tunes they create, pulling from indie rock, jazz, hip-hop, and even world music. They're able to stitch these sounds together to create their own, winning over SXSW and Bluegrass Festival audiences for the past few years. Their CMJ Top 200 charting garnered a much larger audience for the group, for this highly anticipated Turf Club show. Grab a ticket soon if you haven't already! Frankie Lee will be hosting yet another Clown Lounge Sunday in the Turf Club basement, following his epic, sold-out performance last Sunday. For only five dollars it is possible to catch one of the most celebrated folk artists in the Twin Cities currently performing. His weary alternative country tunes will make anyone shed a tear, filling the breaks with lyrics containing heartbreak, loneliness, and the drag of city life. Don't miss this heartfelt songs of local Frankie Lee every Sunday this month!